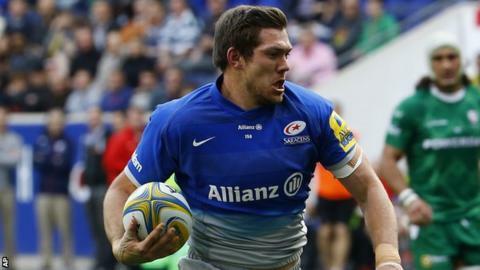 Alex Goode scored 19 points as Saracens returned to the top of the table by beating London Irish in the first Premiership game to be played overseas. England full-back Goode's first-half try in New Jersey, USA, gave Sarries the lead after Greig Tonks' penalty had put Irish ahead. Alex Lewington's try and two more penalties from fly-half Tonks saw the Exiles lead 13-7 at the break. But four Goode penalties and a late Nick Tompkins try won it for Saracens. Tompkins' score, followed by Goode's conversion, not only ensured that Saracens climbed back above Exeter, who had gone top by beating Newcastle earlier on Saturday, but also robbed bottom club London Irish of at least a losing bonus point. And, although they had time to restart the game, the kick-off went out of play to leave Irish eight points behind second-from-bottom Newcastle. There were plenty of empty seats at the 25,000-capacity Red Bull Arena in what is expected to be the first of several fixtures in the United States as Premiership Rugby look to expand the competition to new markets. But the crowd was treated to two fine individuals finishes from Goode and then Lewington as Irish deservedly led at the break. The Exiles were unable to match that intensity as Sarries raised their game in the second half, although the result was in doubt until Tompkins, a late replacement in the starting XV for Argentina international Marcelo Bosch, collected a charged-down Darren Allinson kick to run in unopposed. "We'll rue a few of our decisions at the end of the game. They (Saracens) suffocated us, we came out with a plan, but we weren't able to execute it. "I thought we gave away three cheap penalties, which meant they managed to get themselves in front and then we had to play to try and get something out of the match. "We'll probably rue that opportunity to kick to the corner rather than take the three points when we were 16-19 behind, it was probably a reasonably poor decision in retrospect. "We need to win, it's as simple as that. That was our mantra all week, but in the end we got caught trying to play too much rugby in our own half. "In this state of mind, when you're in a season where things aren't going so well, those sorts of things tend to roll against you." "We faced a team scrapping for their lives at the bottom and our squad isn't our proper one with all our internationals away. "We were pretty ordinary in the first half, in fact we were awful. We were lucky to be only 13-7 behind. "But, we showed a lot of character and togetherness. They're good qualities to show and to win the second half by 20-3, it's a massive, massive four points for us. "The league is tight and clubs are going on little runs. For us, it was all about getting a result today and we're thrilled to have got it. "We just know there's a points tally you need to get to to get into the top four. We're getting closer to it, we're not quite there yet." London Irish: Maitland; Lewington, Hearn, Williams, Ojo; Tonks, Steele; Smallbone, Cruse, Aulika, Symons, Stooke, Narraway (capt), Cowan, McCusker. Saracens: Goode; Ellery, Tompkins, Barritt (capt), Wyles; Mordt, Spencer; Barrington, Saunders, Figallo, Smith, Hamilton, Rhodes, Burger, Wray. Replacements: Porecki, Lamositele, du Plessis, Hargreaves, Brown, de Kock, Earle, Ransom. Can Premiership rugby break the US?